The size of this massive ice cube or iceberg in the Atlantic Ocean, is way larger than the humpback whale which usually grows to around 52 feet or 16 metres long. I'd been looking for a shot like this for years, and finally had the whale, the ice cube, and myself lined up perfectly. You can see the notches in the whales tail as it dives away in the opposite direction. 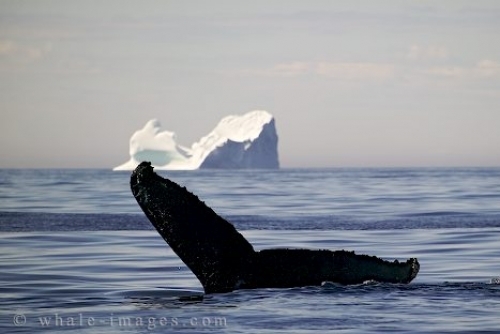 Newfoundland in June is perfect to capture a humpback whale and an ice cube within one picture. Picture of a Humpback Whale tail in front of an iceberg off the Newfoundland coast, Canada.